In India, we have so many types of cuisine and yet we have many dishes that are almost identical, with regional variations of course. This is one of them – a variety of dosa. But before telling you more about it, let me tell you a story – actually a family lore. I was about three at the time of this incident and so don’t have any recollection of it. But I have since heard it repeated so many times, that it is as if I had been there! 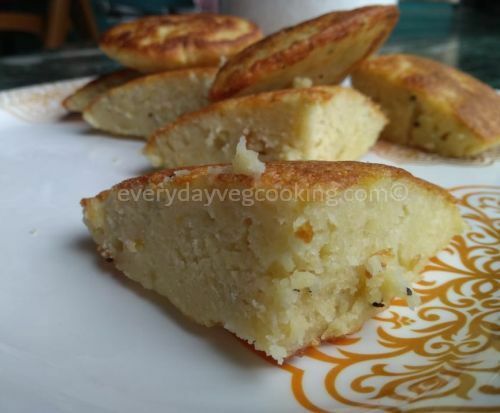 My mother had made this dosa one morning and was packing lunch for my elder siblings and asked them how much dosa each wanted in the lunch box. (In Tamil the word for ‘many’ is sometimes interposed by ‘much’). ‘Come into the kitchen and then tell me!’ called Amma. She went into the kitchen and screamed at the dosa being held out by Amma. It was not just a dosa, but a DOSA – as big as a large plate and at least 2” thick, enough to feed four of them! other made it in a smaller version of the vessel. I don’t have those traditional vessels and so make it in a heavy bottomed kadhai. It takes a long time to cook, but the advantage is that one can make just a few of them for a big family. Being a protein-rich dosa, it is very filling. 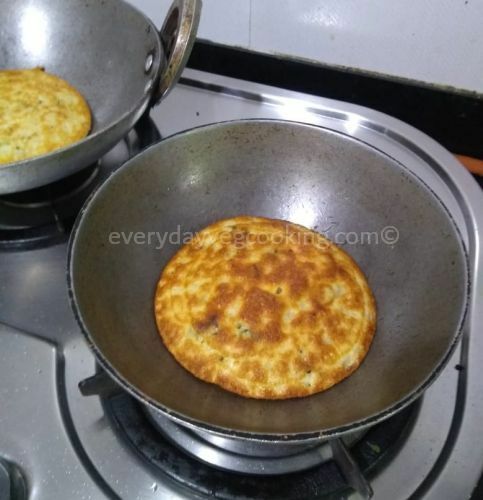 I make thick dosas in a kadhai with the normal dosa batter too in this way, adding onions, green chillies and curry leaves, but tavala dosa has a special batter. I told at the outset that this dosa has an almost identical twin, didn’t I? Well, it is the Gujarati Handwo with some added ingredients. Let us look at the recipe now. 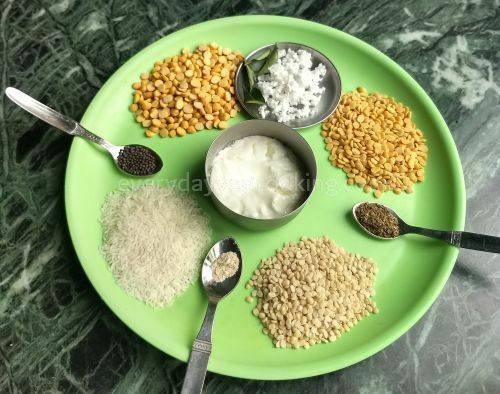 Ingredients for Tavala Dosa: (Makes about 7- 8 DOSAs). Oil for tempering and making dosa. Soak the rice and dals for at least 4 hours and grind into a coarse paste. It should be like suji to touch. You can soak it overnight if you are going to make it for breakfast or lunch box the next morning. It does not require fermentation and can be made instantly by adding the curd. Give some extra time for making the dosa as it takes a while to cook, being thick. Heat 1 tsp oil in a tadka pan and pop mustard into it. Once it crackles, add the broken chillies, curry leaves and hing, in that order. Pour it into the ground batter. Add the grated coconut, curd, the required salt and mix it all well. Now heat a heavy bottomed kadhai and add a tsp of oil in it. Let it become hot and then sprinkle a few drops of water in it and close with lid. Wait for the water to evaporate. Do this on a low flame. The kadhai will be well seasoned for you to begin making the dosas. 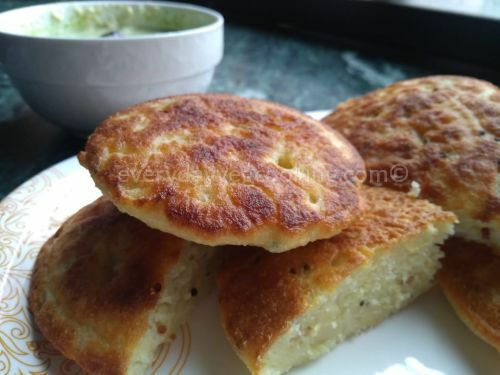 Pour 2 or 3 large ladles of batter in the kadhai. Don’t spread it. It has to be thick. Drizzle a little oil or ghee if you like, around the edges. Cover with a lid and cook on very low heat. It takes a while to cook as it is thick and needs to cook through. After about 3-5 mins, check to see of the edges have browned and crisp and the top looks cooked. Flip over and let it cook on the other side. Don’t cover with lid. After about a minute or two, remove from the pan. It will slide out easily. Your DOSAs are ready to serve. You can leave the ground batter overnight to ferment. If you are using fermented batter, don’t add curd. If you are not worried about the calories, you can add some oil on the second side too. It will be super-crisp. Even without the extra oil, it will be great. 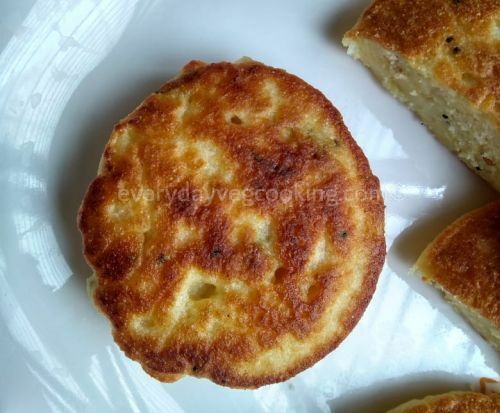 If you don’t have the time to make thick DOSAs, you can make them thinner too, but the fun is in cutting it into wedges and eating it with milagai podi (slang: molaga podi) or creamy coconut chutney. It even tastes yummy. Do try it! Interesting story. I have tasted Tavalai dosai myself. My amma made a much-modified version of it to feed us. Most traditional dishes have individual twists and kai manam; (literally meaning hand flavour!) as we call it in Tamil. And then a mother’s kai manam can never be replicated, can it? Kadhi dosa is looking very tempting. Pic is also so beautiful feel like picking up dosa from there and eat it . Yes I remember, we all enjoyed eating kadhi dosa , it was very tasty and out daughter clicked many beautiful pics.